The sphenopalatine ganglion (SPG) has a critical role in the modulation and regulation of cerebrovascular autonomic physiology in the head and face region. 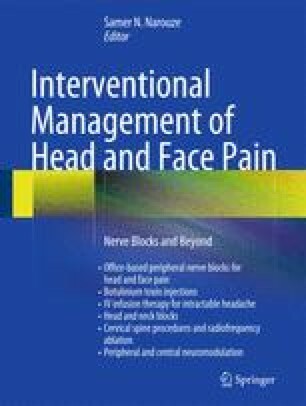 Consequently it has been implicated in the pathophysiology of different autonomic cerebrovascular phenomena in these regions of the body such as headache syndromes including cluster headaches, migraines, and trigeminal autonomic cephalgias (TACs) as well as cerebral vasospasm and stroke. This burgeoning interest and research of its role in these conditions has been accompanied by the development of strategies to target and modulate its activity. Electrical stimulation has emerged as a prime method for modulating the activity of the SPG because such modulation can be adjusted and is reversible. The relative ease of accessing the SPG in the pterygopalatine fossa has also made it easily amenable to approaches for electrical stimulation. In this chapter, we will discuss the indications, procedure, and potential complication of SPG stimulation.